To say The Waterworks sells and services the highest-quality spas and saunas is very true. That’s the essence of what we do but our story is much more than just the products we sell. We enjoy serving Alaskans and helping them in their wellness and relaxation journey. Our multiple store locations have now become a beacon for spa and sauna lovers throughout Alaska. Why do they insist on The Waterworks? Because they know they can count on genuine service, an inviting atmosphere and a superb array of products tested specifically for the harsh Alaskan climate. Tim and his wife Linda made Girdwood home and soon Tim was developing underwater camera systems that could take photos in the zero visibility Cook Inlet waters. 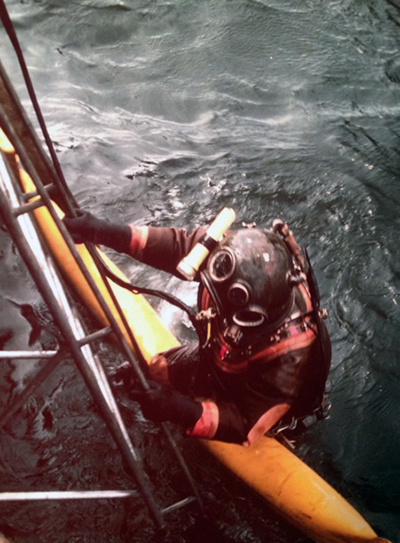 He tested his equipment in the first Redwood Hot Tub in Girdwood. Once fellow Girdwoodians found out that the Bennett’s had a hot tub, they wanted their own. Tim and The Waterworks crew built Redwood Hot Tubs well into the mid-1980’s until “portable” hot tubs became the new norm. Tim and Linda wanted to keep their clients happy and after much research, they found a company that had created a portable hot tub worthy of Alaskans, a Hot Spring Spa. These initial clients helped create the buzz that built the business. Many of them have purchased their second and third hot tubs from the Waterworks because of the service they have come to expect and have received. As the list of happy clients has continued to grow, it has stayed true to its roots believing that every spa and sauna owner becomes a part of the Waterworks Family. 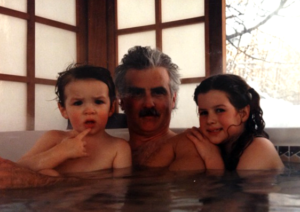 (Photo of Bennett family enjoying their hot tub. Left) Today, the tradition is carried on, as the Waterworks is operated by the second-generation owner, daughter Kali Tucker. The Waterworks continues to offer the highest-quality spas and saunas from Finnleo Saunas, Hot Spring Spas, Hot Spot Spas, Caldera Spas, Freeflow spas and still the occasional Redwood Hot Tub. Now that you know the whole story…welcome to the Family! 9,500 Happy Clients and Counting.